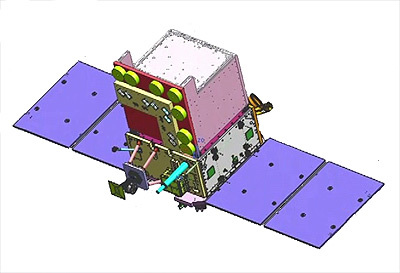 On April 1, 2019, the Indian Space Research Organisation (ISRO)'s Polar Satellite Launch Vehicle (PSLV), in its 47th mission (PSLV-C45) successfully launched a military reconnaissance satellite (developed by India's Defence Research and Development Organisation - DRDO) to the orbit along with 28 other foreign satellites from Satish Dhawan Space Centre - Sriharikota Range (SDSC-SHAR). The launch comes six days after India test-fired an anti-satellite (ASAT) missile in the Mission Shakti operation. 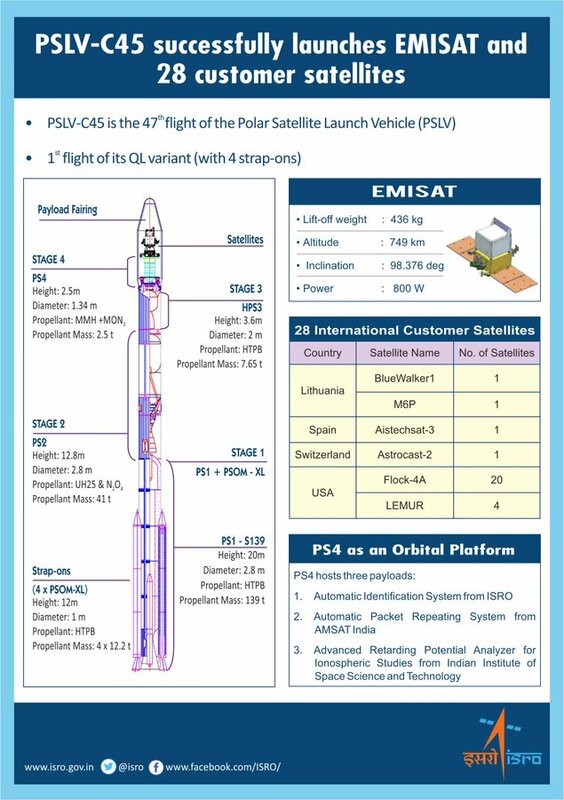 PSLV-C45 lifted off at 9:27 (IST) from the Second Launch Pad and injected 436-kg EMISAT into a 748 km sun-synchronous polar orbit, 17 minutes and 12 seconds after liftoff. 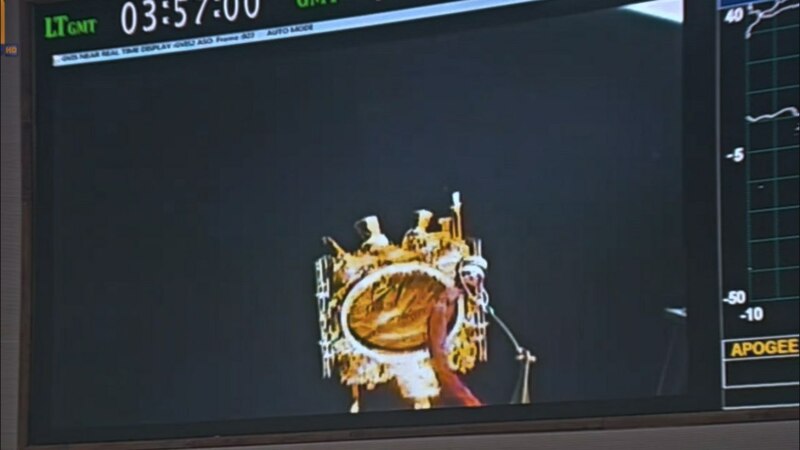 After separation, the two solar arrays of EMISAT were deployed automatically and the ISRO Telemetry Tracking and Command Network at Bengaluru assumed control of the satellite. In the coming days, the satellite will be brought to its final operational configuration. The last customer satellite was placed into its designated orbit 1 hour and 55 minutes after lift-off. The PS4 orbital platform will provide a microgravity environment for research organizations and academic institutes to perform experiments. 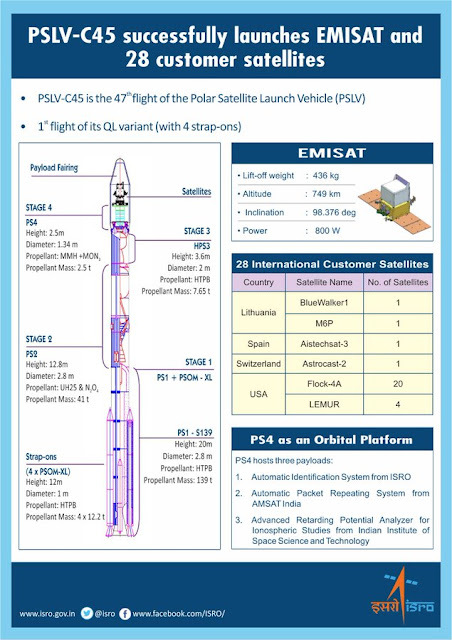 In this mission, the PS4 hosts three payloads, namely, Automatic Identification System (AIS) from ISRO, Automatic Packet Repeating System (APRS) from AMSAT (Radio Amateur Satellite Corporation), India and Advanced Retarding Potential Analyzer for Ionospheric Studies (ARIS) from Indian Institute of Space Science and Technology (IIST).